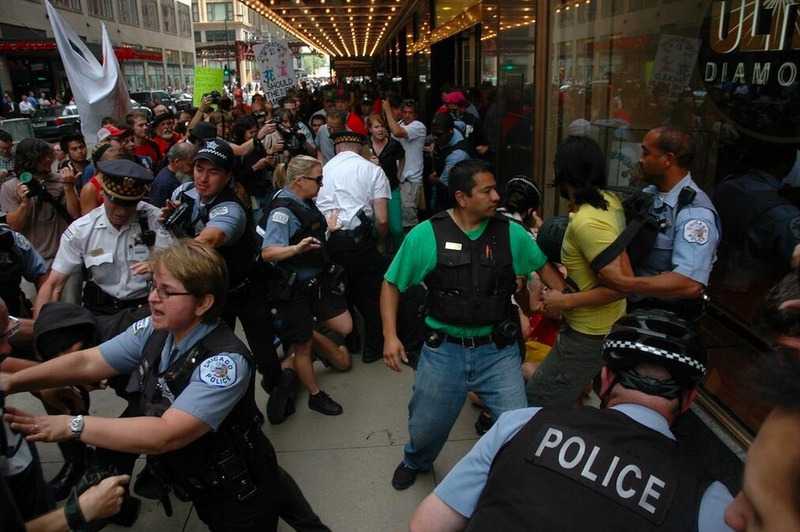 Police tangle with protesters at ALEC’s 40th Annual Meeting at the Palmer House Hotel in Chicago in August. The American Legislative Exchange Council (ALEC) held its 40th annual meeting earlier this month at the Palmer House Hotel in Chicago, drawing a crowd of about 3,000 protesters. ALEC is a conservative bill mill that masquerades as an educational nonprofit. ALEC holds meetings in tony resorts and at fancy hotels, where it provides corporate lobbyists with face time with thousands of state legislators over dinners, happy hours, tennis, golf and other activities. Corporate representatives draft the “model bills’ they prefer, and at ALEC meetings, hand them off to legislators, who then take them home and introduce the bills in their own state legislatures as if they were their own ideas. The public is not allowed to weigh in during any phase of the drafting of any of ALEC’s so-called “model bills.” The prime sponsor of ALEC’s 40th annual meeting was tobacco giant Reynolds American, who ponied up $100,000 for the honor. $50,000-level sponsors include ExxonMobil, the Cigar Association of America, Inc., Peabody Energy, the American Coalition for Clean Coal Electricity, a front group for coal companies. Other sponsors include CenturyLink, UPS, Pharma, Cloud Peak Energy, TransCanada and BNSF Railways. ALEC is responsible for the proliferation of “Stand Your Ground” laws, the type of law that permitted George Zimmerman to kill Trayvon Martin, an unarmed African-American Florida teen, and get away without any punishment. About two dozen states how have such “shoot first” laws. Many protesters at ALEC’s Chicago meeting wore hoodies and with targets on their chests and backs that said “Stand Your Ground.” Activists unfurled huge banners inside the Palmer hotel that said “ALEC makes For-Profit Prisons,” “Moral Monday – NO to ALEC” and “ALEC Attacks All Workers.” The peaceful protest turned violent after Chicago police rushed into the crowd and started arresting people and beating them to the ground. Photos of the protests can be seen here.